Today I had to make something to take to a Jacob's Table gathering and I (eventually) settled on some cakes. After noticing the chocolate eyes for the Ooey Gooey Chocolate Cakes were in stock I abandoned the idea of the eyeless version of this recipe so I could do the proper thing next week for Halloween. If not chocolate, then lemon: so I thought of Sansa's Lemon Cakes. I didn't particularly want to do a straightforward lemon drizzle cake, so I looked around a bit. I do have a Game of Thrones Cookbook which I seem to recall had a crumpet-style recipe, but I couldn't find the book to check and that idea just seemed wrong for cakes. So I looked around online and found Geeky Chef's version which has a lightly candied lemon slice baked at the bottom of each cake. Brilliant. Then I was getting ingredients and I realised I fancied trying a Honey Cake - which I have never tried before. So I found James Martin's recipe for the BBC. These two form the basis for what I did. Heat Water and Sugar in a pan to make a syrup. Once Sugar is dissolved, add lemon slices. Allow to simmer/boil for 20 minutes or so, or, frankly, while you're making the cake mixture. Preheat oven to 180C/350F/Gas 3 and butter and line the bottom of a 7in/18cm cake tin or grease 12 muffin tray holes. Place one candied lemon slice into each muffin hole (or arrange at bottom of large tin). 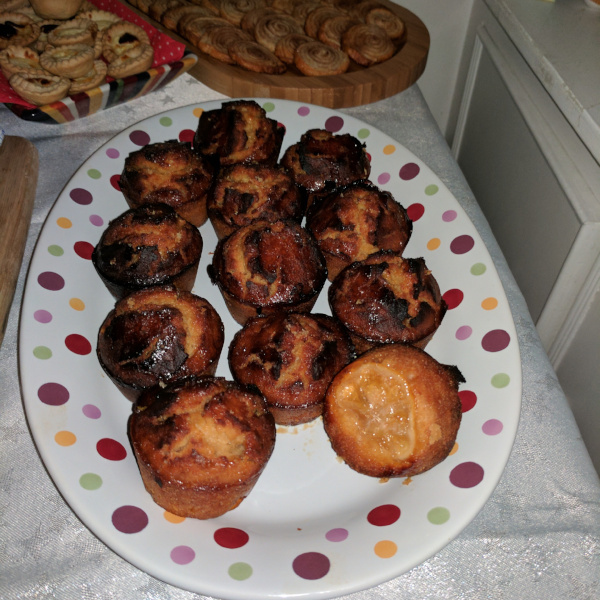 Spoon into the cake tin/muffin tray and bake for 40-45 minutes (less for the muffin style - I also found it important to turn them in the oven - may just be my oven) until the cake is springy to the touch and shrinking slightly from the sides of the tin. So, there you have it, my version of Sansa's Lemon Cakes!